New Mexico’s fall involves the gold of aspens and cottonwoods, but very little red. In the Albuquerque area the big exception is the maples of Fourth of July Canyon. 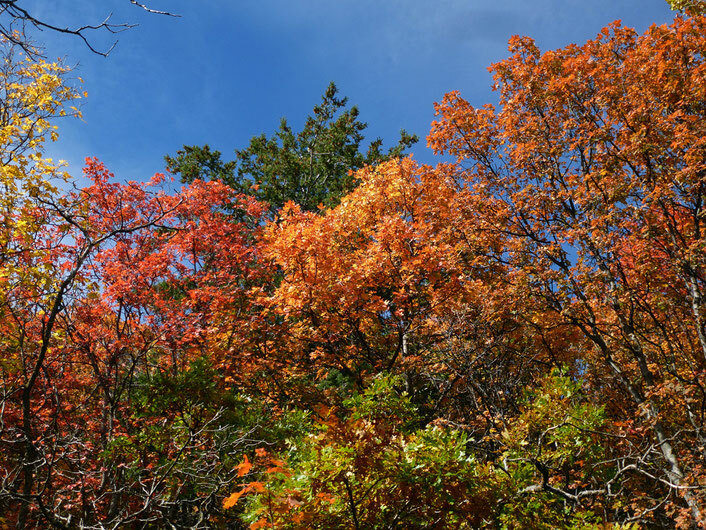 This fall hike is well worth doing in the spring and summer as well. It’s one of multiple routes accessible from the Fourth of July campground area. From Albuquerque take I-40 east and leave at the Tijeras exit. Head south through Tijeras on NM 337 and where that highway comes to a T, turn right (west) and drive the short distance to Tajique. Once there the highway bends left (south); soon afterwards, turn right (west) onto the graded road to 4th of July Canyon. The turnoff is well-marked, and it's just before a tall cylindrical water tower. Continue all the way to the 4th of July campground. Just shy of the regular camping spaces is a parking area for hikers; park there to avoid campground fees. Follow the right fork in the campground road to the trailhead (34 deg. 47.535 min. N, 106 deg. 22.917 min. W; 7600 feet). From there head up canyon (west). You may encounter a trickle of water in the canyon bottom, and you'll certainly see a dry spring box, but be patient and soon you'll pass the wildlife drinker shown to the left. If you harvest water from this drinker (I don't know why you'd be low on water, so close to the trailhead), be sure to purify it. A short distance beyond the drinker, pass the intersection with the Albuquerque Trail at 34 deg. 47.839 min. N, 106 deg. 23.625 min. W (you’ll be back here later). When you reach the Cerro Blanco trail at 34 deg. 47.526 min. N, 106 deg. 23.796 min. W, turn right (northwest). When you reach the Crest Trail, at 34 deg. 47.845 min. N, 106 deg. 24.054 min. W, turn right (north). (Or turn south on the crest trail, as I describe below). About 400 meters north of the intersection is a high pass through which you can inspect the Rio Grande Valley. Continue north from the pass on the Crest Trail. At 34 deg. 48.567 min. N, 106 deg. 23.847 min. W, take the Mosca Trail downhill (east). Shortly before you reach this point, you’ll reach the maximum elevation for the hike (8880 feet), with Mosca Peak (9509 feet) looming to your left. At 34 deg. 48.473 min. N, 106 deg. 23.363 min. W, you intersect the Albuquerque Trail. Turn right (south) and follow the upper part of Albuquerque Trail to its intersection with the 4th of July Trail (coordinates provided above), completing the loop. Retrace your steps down the 4th of July Trail to return to your car. If you turn south instead of north along the Crest Trail, the trail parallels the crest of the Manzano Mountains and offers some great views. The western fringe of the High Plains is to your east, and the Rio Grande Valley is to your west. You can continue as far south as your time and energy allow. However, the trail cuts through low scrub in many places, and your legs will be brushing against that scrub almost continually. Because of that I recommend wearing long pants for a hike in this direction, followed by a check for ticks when the hike is done.